It was a full house at St Philip Neri Catholic Church in Smethwick today, Sunday, as the community gathered in force to celebrate a landmark anniversary. The celebration mass attracted anyone and everyone with a connection to the beautifully decorated church, and was celebrated by The Most Reverend Bernard Longley, Archbishop of Birmingham, and former parish priests and clergy. Pupils from St Philip’s Catholic Primary School were involved in the liturgy and a special setting of the Psalm had been composed just for the occasion. The church boasts a string of connections with Blessed (Cardinal) John Henry Newman and the hymn writer Edward Caswall, and at this special mass the congregation raised the roof with a rendition of ‘Praise to the Holiest in the Height’ written by Newman. In his Homily, Archbishop Longley said today’s occasion had the feeling of a family get together – “you all have a part in this family, this gathering”. Archbishop Longley also praised the work of the primary school and Brushstrokes, which both play a big part in the community. 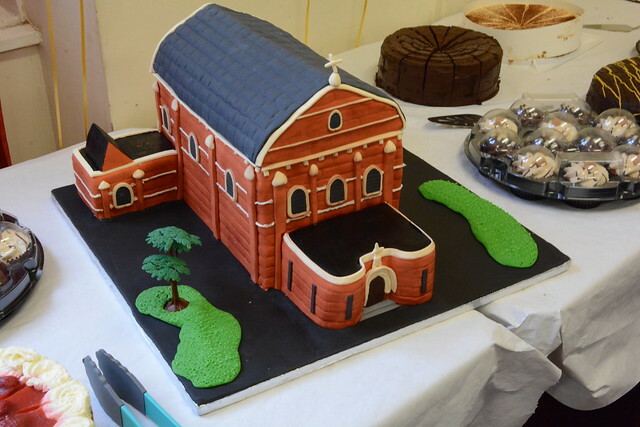 After the celebrations in church, the congregation gathered for a hearty buffet lunch (including a fantastic church cake!) and had the chance to look at a display of photos and archives from years gone by. The Parish of St Philip Neri was founded by Fr Edward Caswall in 1863 with Fr John Flanagan as the first resident priest. Fr Charles Rhyder came to Smethwick in 1882 and by 1893 had the main structure of the present church built. The lady chapel and sacristies were opened in 1904 and the sacred heart chapel in 1908. The church was consecrated by Archbishop Thomas Williams on 25 June 1936. The current parish priest is Rev Fr Erasmus Egenonu.